"I have been extremely troubled by the efforts of a group of retired generals to force the resignation of our Defense Secretary, Donald Rumsfeld," Ford, 92, wrote. "President Bush is right to keep him in his post. It is the President's decision -- and his alone." Ford wrote that retired generals should not decide the nation's war policies and leadership lest it set "a dangerous precedent that would severely undermine our country's long tradition of civilian control of the military." As a student of history, I confess to mixed feelings about this situation, quite apart from the merits or deficiencies of the generals' critique of Rumsfeld's performance as defense secretary. It is essential that active duty military personnel remain subordinate to the Commander-in-Chief, the President, and his civilian appointees. American constitutional government would be in trouble if this institutionalized tradition were breached. Abraham Lincoln and Harry Truman were two chief executives who had to fight to maintain this element of the US Constitution in the face of political generals--McClellan and MacArthur, respectively--whose reckless courting of popular opinion threatened America's democratic institutions. Nonetheless, we have a tradition in America of turning to former generals, for presidential leadership. The track record of generals-turned-pols is mixed. I count Washington and Eisenhower as among the greatest US presidents. Andrew Jackson is a hero to some; I can't agree. The remaining generals-turned-presidents form a sort of Hall of Mediocrity: William Henry Harrison (who served only a month as president); Zachary Taylor (who also died in office); and Ulysses S. Grant. What is disturbing about the statement of the former generals calling for Donald Rumsfeld's resignation is that this isn't just one esteemed general throwing his hat into the political ring. It's a group of recently-retired officers offering their opinions in a way that could sow discontent among the military personnel they have just commanded, legitimizing selective obedience to orders. No matter how we feel about the war, the President, or the Secretary of Defense, selective subordination to constitutional government isn't something we want to encourage. We don't need cabals of general officers speaking out against their bosses, or evening the score with Secretaries of Defense whose policies they dislike. Nor do we want to encourage the development of deeply politicized officer corps. The history of the world demonstrates that to be disastrous for freedom. But, under our system, these retired former generals have as much right to speak out as any other citizen. Here, as in so many other aspects of our system of government, the restraint and self-control of people who love their country and value its Constitution are essential. That's the headline I'd be tempted to write for this story. Of course, that would overlook the far more serious aspect of the thing, which is the professionalization of high school sports. I don't like it. an intriguing commentary from Caroline Langston that ran on NPR yesterday. Gloomy today. And there’s a word that needs rethinking; since the “-y” makes something seem silly and trivial nowadays, it detracts from the power of the thing it’s describing. Gloomorous, then. The sun just came out, so strike that. No, there it goes again. That’s always a strange thing to see on a gloomorous afternoon; the sun suddenly illuminates everything in glory and warmth, then steals away. Like sitting in North Korea watching State TV and suddenly the Seoul channel pushes through for a few seconds. Color! Food! Commerce! Then it’s back to 15,000 youngsters doing a synchronized ballet to commemorate the invention of the polio vaccine by the Great Leader. The picture to the right really does portray a gloomy, gloomful, gloomorous day, doesn't it? Click on the pic to see where it came from; it's part of a collection of good photographs from Penn State and environs. Hey, maybe that should lead us to a new word for gloomy: "It was a nittany day." Nah! It ends in "-y." The word "Nittany" seems to have been derived from a Native American term meaning "single mountain." (Since a number of Algonquian-speaking tribes inhabited central Pennsylvania, the term can’t be traced to one single group.) These inhabitants applied this description to the mountain that separates Penns Valley and Nittany Valley, overlooking what is today the community of State College and Penn State’s University Park campus. The first white settlers in the 1700s apparently adopted this term, or a corruption of it, when they named that mountain, i.e., Mount Nittany or Nittany Mountain. Thus by the time Penn State admitted its first students in 1859, the word "Nittany" was already in use. So, they're the Penn State Single Mountain Lions? Maybe there's a market for a feline eHarmony.com. Be that as it may, the Penn State football team certainly handed Ohio State Buckeye fans a nittany, I mean, a gloomorous, day last fall. Ohio blogger Michael Meckler has an interesting review of a book composed of essays exploring why Ohio has played such an important role in US History, including voting for the winning presidential candidates in 36 of 38 elections, sending eight of its own to the White House--more than any other state, and living as a microcosm (in countless ways) of the country at large. I may have to order this book! Writer and blogger Deborah White is taking one of her blogs, Heart, Soul, and Humor, in a new direction. Deborah sums up her new approach: "more faith matters, less politics"...and comments. To initiate this new direction, Deborah shares a bizarre quote, straight out of the Creflo Dollar School of Perverted Sub-Christian Theology, from Mary J. Blige. How about going over to Deborah's site and responding to the Blige Bilge? ...about the children born, one to Brooke Shields and her husband, the other to Katie Holmes and that guy who jumps on couches and stuff. The babies were born on the same day. 1. The Christian perspective on immigration is certainly consistent with American tradition. That is, Christians will want to welcome legal immigration to America. One of my wife's bosses grew up in rural northwestern England, close to Wales. As a teenager, she took a job as a nanny for the family of a young business executive from America. When the exec's company moved him back to the States, she was asked to come back with them. She was seventeen and within the first week, she met her future husband. She's been here for forty-two years now and has been married nearly as long. She and her husband have raised a family here. "I haven't become a citizen yet," she says with a twinkle in her eye. "I know I should. But I am legal. I've got a green card and everything." At least twice a week, I get a dinner or a lunch at a nearby Chipotle's. Among the hard-working employees there are a number of immigrants from Mexico who sometimes take their breaks with their spouses and children in the restaurant dining area. All of these people have found a new life in America and done so legally. They are contributing and productive members of our society. In their faces and their stories, I see the story of my own American ancestors: The red-headed, blue-eyed Irishwoman who was my great, great grandmother; the French Huegenots who settled in New Paltz, New York in the 1600s; and others. It's both Christian and American to welcome people from around the globe to add their contributions to the stew that is the American melting pot. 2. As a sovereign nation, the United States has the right to establish firm rules on immigration, to safeguard its borders, and to regulate the activities of all who come into the country. Indeed, the US government owes it to its citizens to do this. This must include restricting the inflow of immigrants. It also includes deporting the estimated 12-million illegal residents in the US right now. And it includes enacting safeguards that will deter the efforts of would-be terrorists. American businesses so driven by the bottom line that they willingly hire illegal workers, avoiding the extension of benefits to them, underpaying them, and subjecting them to multiple risks and dangers. Just a few thoughts. I don't know what the answers are exactly. But I pray that we'll keep looking through these three windows as we pursue solutions. THANKS...to John Martin of Martin's Musings for linking to this and all four installments of the immigration series. Thanks also, John, for the kind words! 26A week later his disciples were again in the house, and Thomas was with them. Although the doors were shut, Jesus came and stood among them and said, “Peace be with you.” 27Then he said to Thomas, “Put your finger here and see my hands. Reach out your hand and put it in my side. Do not doubt but believe.” 28Thomas answered him, “My Lord and my God!” 29Jesus said to him, “Have you believed because you have seen me? Blessed are those who have not seen and yet have come to believe.” 30Now Jesus did many other signs in the presence of his disciples, which are not written in this book. 31But these are written so that you may come to believe that Jesus is the Messiah, the Son of God, and that through believing you may have life in his name. 1. This passage recounts the second and third appearances of the resurrected Jesus in John's Gospel. There is a fourth appearance to come, in John 21. ...words and sight are important -- although neither Greek words: logos nor rhema are used. The first appearance ends with Mary announcing [aggello -- only occurrence in NT] to the disciples, "I have seen the Lord" and then telling them what Jesus had told to her (20:18). The second appearance results in the disciples telling Thomas, "We have seen the Lord" (20:25) -- (the same words that Mary had used). The same word is used by Jesus to Thomas in v. 29: "Have you believed because you have seen me?" This suggests that believing involves more than just seeing the risen Lord. Each of these verbs is in the perfect tense, which implies a past action with continuing effect in the present. They saw something in the past and that seeing continues to affect their lives in the present. The writer concludes the third appearance with his statement about the purpose of the declaration of his words in writing. The story does not end with "seeing the Lord," but by believing and sharing the message. (2) M. Craig Barnes, the wonderful preacher, suggests that disciples were afraid of their Jews not just because of the possibility of their being killed, but also because they were ashamed for their disloyalty to Jesus. (3) "Peace be with you" was a common greeting in Old and New Testament cultures. There is though, a particular irony in its use here and a particular need the disciples would have felt for God's peace. v. 2o: (1) Jesus allows the disciples to see His wounds, confirming evidence that the full-embodied form before them is the Savior they had seen die. v. 21: (1) Jesus underscores the peace that He gives by repeating this blessing to the disciples. (2) Through Jesus, we're deputized and empowered to share the Good News as He had been. This echoes words from Jesus' high priestly prayer found in John 17.
v. 22: This is a sort of Pentecost, when you think of it. (Acts 2) The word spirit is pneuma in the Greek of the New Testament and ruach in the Hebrew of the Old Testament. Both words can mean wind, breath, and spirit. In the second Genesis creation account, God breathes His ruach into inanimate dust and the first man comes to life. In the first creation account, God's Spirit, like a mighty wind, bears down on the stormy waters of primeval chaos and life comes into being. Through the impartation of His Spirit, Jesus, God-enfleshed, creates the Church, the community of believers in Him who proclaim forgiveness of sin to all who repent and turn to Christ and the need for repentance and believe to all. v. 23: "If you forgive the sins of any, they are forgiven them; if you retain the sins of any, they are retained.” Here, Jesus entrusts what's called "the Office of the Keys" to the Church. It is that authority which Christ gave to his church to forgive the sins of those who repent and declare to those who do not repent that their sins are not forgiven. Truly I tell you, whatever you bind on earth will be bound in heaven, and whatever you loose on earth will be loosed in heaven. That's because Thomas always struggled with unbelief. Given what we know about Thomas, this isn't piety, but sarcasm. It makes no sense to him for Jesus to get closer to those who conspire against him. Nor does it dawn on him, in spite of all that he's seen to this point, that Jesus can raise Lazarus from the dead. 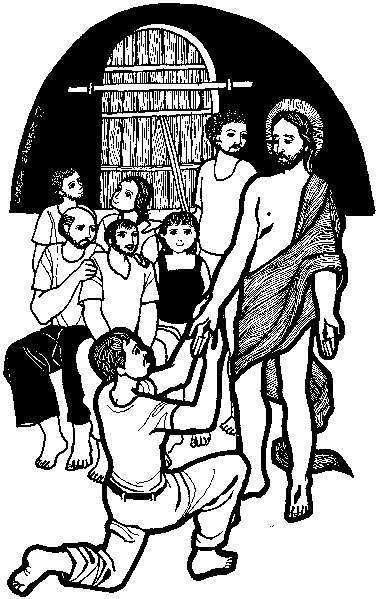 (2) We often often call the Twin, Doubting Thomas. But as Brian Stoffregen points out, the text, in the original Greek, never speaks of Thomas as one having doubts. The battle raging inside of Thomas throughout is instead, between belief and unbelief. v. 25: An interesting question to consider is where Thomas was when Jesus first appeared to the others? I don't know the answer to that. v. 26: (1) A whole week has passed; it's another first day of the week. Once more, Jesus transgresses locked doors, indicating that He is no longer limited by time and space as He had been before His death and resurrection. (2) Once again, Jesus greets the disciples with the words, "Peace be with you." v. 27: (1) Jesus goes directly to Thomas with the evidence of His resurrection. I think that there's an important principle at play here: If we want to believe, Christ will help us to believe. (2) Jesus doesn't tell Thomas, "don't doubt." (Although that's not a terrible translation.) He literally says, "Be not faithless; be faithful." The point is that we must make a decision whether to allow God to create faith in us or not. We must cease and desist from our resistance and ask God to do this. We must put our dukes down and let God be God. v. 28: To me, Thomas' response is so ironic. The faithless, double-minded one issues the most emphatic and all-inclusive confession of Jesus to be found in the Gospels: "My Lord and my God!" v. 29: These words are really about all of us who haven't seen the risen Jesus (YET) and still believe in Him. vv. 30-31: (1) I've called this the mission statement of John's Gospel. (2) The unspoken implication here is this: I've told you everything you need to know in order to believe in Jesus Christ. To come to faith in Christ, we don't need more evidence; we only need to surrender! "I feel the need to add that Mark is an Ohio State grad who writes like he went to a real college. Go figure." So writes Charlie Lehardy in a kind and witty post linking to my two most recent pieces on immigration policy. I told Charlie that whatever compositional skills I can claim were drilled into me by my excellent high school English teacher, Rosemary Leuchter. Anyway, thanks to Charlie and to John Martin for linking again to the immigration series! "Oh, and Mr. President, when are you thugs going to release Hao Wu?" That would be a good way for President Bush to begin one of his conversations with visiting Chinese president, Hu Jintao, today. For more information on Hao Wu's situation, look here. 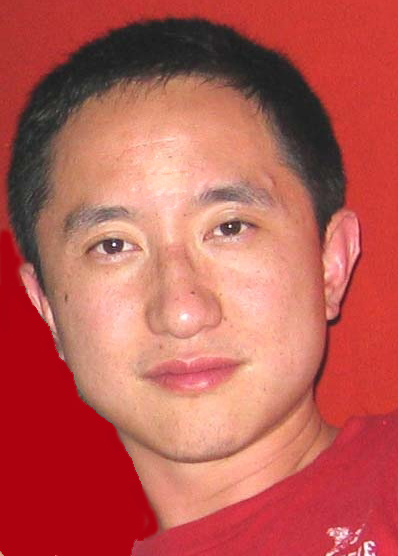 To push for his release, you can send emails to the Chinese embassy, here. In this series, I'm viewing the immigrarion issue with which we're dealing in the United States these days through various Christian "windows." Each of these views will hopefully, help us to see our ways to formulating our own views on the subject. Governments are ordained by God to promulgate laws that maintain order. Inherent in that is the right to maintain and safeguard borders and the inflow of immigrants. God values justice, which in Biblical terms is love enacted in life. Although heaven and the heaven of heavens belong to the Lord your God, the earth with all that is in it, yet the Lord set his heart in love on your ancestors alone and chose you, their descendants after them, out of all the peoples, as it is today. Circumcise, then, the foreskin of your heart, and do not be stubborn any longer. For the Lord your God is God of gods and Lord of lords, the great God, mighty and awesome, who is not partial and takes no bribe, who executes justice for the orphan and the widow, and who loves the strangers, providing them food and clothing. You shall also love the stranger, for you were strangers in the land of Egypt. You shall fear the Lord your God; him alone you shall worship; to him you shall hold fast, and by his name you shall swear. He is your praise; he is your God, who has done for you these great and awesome things that your own eyes have seen. Your ancestors went down to Egypt seventy persons; and now the Lord your God has made you as numerous as the stars in heaven. God is the Lord of all creation. Because God is fair, His people were to be fair to all people, even loving the alien among them because, for 430 years, they had been aliens--even slaves--in Egypt. In fact, their whole history from the time of their patriarch, Abraham, was about being aliens. God loved the stranger and His people were to love the stranger too. What we see from this and other passages of Scripture, both the Old and New Testament, is that in an ultimate sense, all people are our neighbors and today, through Jesus Christ, all people are invited into relationship with God. In the Old Testament, this is memorably underscored in two extraordinary short books: Ruth and Jonah. In time, Ruth's husband, her brother-in-law (who had married another Moabite women, Orpah), and her father-in-law all died in Moab. Ruth's mother-in-law, Naomi, resolved to return to Israel and Ruth went with her. Later, Ruth became the ancestress of Israel's great king, David, a reproach to any later Israelite s who might tend toward xenophobia. Jonah was a prophet told by God to go to the foreign city of Nineveh and announce simply, "Forty days more, and Nineveh shall be overthrown!" Nineveh's sins were apparently so egregious and pervasive that God lost patience with the people there. But Jonah didn't want to deliver God's message in Nineveh. He hated the Ninevites. Instead, he booked passage on a ship sailing in the Mediterranean. You know what happened next: God sent a ferocious storm. The seasoned sailors on board wondered what was going on. Jonah said that God was mad at him and that if the crew simply tossed him into the drink, all would be well. They was reluctant to comply with Jonah's wishes, especially since it appeared that God had his eye on Jonah. Finally though, they agreed to throw him overboard. As soon as Jonah hit the water, there was a dead calm on the sea. In the end, God pointed out that He cared about all people, even those not numbered among His fold. Here was another reproach to xenophobia on the part of God's people. All Hebrews were called to have a certain solidarity with foreigners and aliens born of their experiences as a nomadic people. Historically, of course, the ancient Jews, dispersed by persecution and the presence of foreign armies, often welcomed Gentile strangers who had come to believe in the God revealed to the Jews. These Gentile "God-fearers" as the New Testament calls them worshiped with the Jews in the synagogues dispersed throughout the Mediterranean basin in the first-century and became, along with many Jews, the first Christians. In other words, acceptance of the foreigner did not include acceptance of the flouting of Israel's laws or of any criminality. This definitely has implications for any Christian's consideration of the issue of immigration policy: We are to be welcoming and supportive of the strangers in our midst. But, from a Biblical, Christian perspective, no one should get a pass: Just as the host owes the guest hospitality; the guest should not be here on false pretenses or in flagrant disregard of our civil laws. That shows contempt for both the host and for the order God has established by ordaining civil government. Tomorrow, I hope to put a bow on this series, suggesting a few implications for how Christians might think about the immigration issue after a consideration of the Bible. ...or in a sunlit city park over a game board. In light of my Sunday revelation that I'm equally inept at Chess and athletics, I have to confess that these Chess Boxers intimidate me. If someone would come up with a game that combines three-point shooting on a basketball court with Scrabble, I could be a contender. ...The level of brutality Central American migrants face in Mexico was apparent Monday, when police conducting a raid for undocumented migrants near a rail yard outside Mexico City shot to death a local man, apparently because his dark skin and work clothes made officers think he was a migrant. Virginia Sanchez, who lives near the railroad tracks that carry Central Americans north to the U.S. border, said such shootings in Tultitlan are common. Alison, a regular reader of this blog and a blogger herself, has given birth to Monroe...baby makes four. In these posts, I don't intend to push a particular agenda on immigration policy in the United States. Instead, I want to present a series of windows through which Christians might look at the issue and then make up their own minds. The first window through which I looked was the Christian belief in law and civil authority. Christians believe that governments exist at the behest of God, even though those governments, run by human beings, may do wrong things. Governments are meant to create a modicum of the order and serenity which would exist in perfection if the barrier of sin didn't exist between God and human beings and among human beings. Governments then, have the right--and the obligation--to establish and maintain borders. Today, I want to look at the issue of immigration through a different Christian window: Justice. These days, the Bible's emphasis on justice is often overlooked. To some extent this may be understandable: Much of what might be appropriated directly from the Scriptures on the subject shows up in the Old Testament, coming from a time when Israel, God's people, were part of a theocratic nation. No nation in the world in 2006 is a Biblical theocracy, making the mandates for Israel's judges and kings found on the Old Testament's pages difficult to apply. Complicating our view through the Bible's "justice window" is that in the New Testament Greek, the word for justice never appears. Its Hebrew equivalent shows up only infrequently in the Old Testament. The relative absence of the word justice definitely doesn't denote an absence of concern for it on God's part. The concept of just treatment of others permeates much of the Old Testament law and prophecy, addressing not only the actions of kings, but also those of ordinary people in their interpersonal relationships. And a commitment to justice is certainly apparent in Jesus' teaching, even in His voluntary death and resurrection for a human race weighed down by the curses of sin and death. To understand the Biblical mandate for justice, we need to study another key Biblical concept. When asked what the greatest of God's commandments are, Jesus responded that there were two of equal importance: to love God completely and to love one's neighbor as one loves one's self. Each of these commandments deals with our relationships with God. You shall honor your father and your mother. You shall not covet your neighbor's wife, nor his manservant, nor his maidservant, nor his cattle, nor anything that is his. Love, in the Biblical understanding of the term, has a lot in common with what we mean today when we talk about justice. For the Biblical writers, love has little to do with what we feel and a lot with what we do. Love, from the standpoint of God's Word, relates to the way we live out our relationships with others. Specifically, it has to do with whether they're marked by a commitment to do for others what we would like others to do for us. In addition to not seeing love as primarily an emotion, contrary to our usual contemporary view, the Biblical writers would also be uncomfortable with our post-Enlightenment notions of justice, which are rooted in ideas about rights and entitlements. They would prefer to speak of the responsibilities each of us have to share the undeserved blessings of God with others and to treat others with respect. In fact, at the outset of Paul's famous commendation of servanthood rooted in the example of Jesus Christ (Philippians 2:4-11), he encourages believers by saying, "let each of you look not to your own interests, but to the interests of others." Gratitude for God's grace and a commitment to love others as Christ has loved us is at the center of the Christian value system, no matter how our lives may be going at a particular time. Through Jesus Christ, Christians live in the confidence that they have a place in eternity. We have the assurance that a God Who, when He came to earth, didn't shirk the cross and then rose from death to give us life, will always be by our sides (Matthew 28:19-20; Romans 8:31-39; Acts 2). The reality of God's grace operating in the lives of people who follow Christ is an objective truth. It's a solid foundation that frees Christians to risk loving their neighbor. In practical terms, that means enacting God's love and justice in the ways in which we live, vote, buy and sell, trade, hire and fire, and so on. How might the cause of Biblical justice--practical expression of love for neighbor born of God's love for all people--be addressed by Christians in the question of changes in immigration policy here in the United States? There are a few responses on the table these days. 1. First, there are President Bush's initial proposals in this matter. Newsweek correspondent Howard Fineman, who has followed the President's career since he was governor of Texas, is convinced that Mr. Bush sees this matter in more than economic terms. He sees it, Fineman believes, as a justice issue. Be that as it may, many who support the President's proposals for a guest worker program believe that a decent regard for the economic conditions under which many live in Mexico and in Latin America should cause us to welcome many into the United States. They also often argue that those who have entered illegally have escaped intolerable circumstances to be productive contributors to the US economy. The Roman Catholic Church has argued that there is a Biblical mandate to open our borders in a responsible way to as many of these guest workers as can be accommodated. It argues that doing so is a simple matter of justice. I hope you include in this series the Christian way to view the millions of US employers who hire these undocumented workers (at low wage with no benefits and poor working conditions) , and the Bush Administration, which knowingly and deliberately chooses to "look the other way" when employers hire illegals. Deborah argues that "a broken US economic system that relies on below-minimum wages paid to illegals (or anyone) to make more profits" is what's behind the presence of 12-million undocumented workers and that this economy results in the unjust treatment of both US and illegal workers. There is an obvious and immediate fix to illegal immigration: criminalize every employer who hires illegals. The issue would be entirely cured in three months. Certainly a number of groups and institutions are culpable beginning with our politicians who pass laws they then underfund so they cannot be enforced, to businesses that take advantage of a ready, willing, and able cheap labor pool, to union organizers who see illegal workers as a new constituency to manipulate and control, to the average American whose only value is reflected best by Wal-Mart's promise of low prices...That said, this isn't just our problem. The biggest culprit in the illegal migration of over 10% of Mexico's population into this country is the Mexican government and the families that have misruled and exploited that country for the past century. They benefit the most by exporting their workers illegally into this country because it acts like a safety valve, reducing the pressure for change by getting rid of those that would benefit most. So, what should Christians do? That's not a hard question, is it? While we are helping the poor and disadvantaged and loving our neighbors as our selves even when those "neighbors" may be a Spanish-speaking migrant worker and his family, we should also examine our own hearts and habits and reflect on the desire for low prices at any cost and then finally, we should harangue our representatives to push for a real fix to the problem, a fix that can only come by reforms in Mexico. Anything less will be just another bandaid and we will be discussing this again in another 10 years or so. Michael thus points to injustices that he sees in Mexico (and presumably others countries) and in the United States as the main problems to be addressed. How we best address the issue of justice and, at times, just where we see injustices is a political judgment. But for the Christian there can be no doubt that however we parse this issue, the call to love our neighbors as we love ourselves, whether those neighbors are immigrants or American workers, consumers, and businesspeople, is one of the windows through which we must examine matters. THANKS: John Martin at Martin's Musings has linked to this post and the first installment of the series. I appreciate your recommending these pieces, John. THANKS ALSO...to Dan at A Slower Pace, who has also linked to the first two installments in this series. Dan also dropped an encouraging email my way. Thanks, Dan. I hope that this series can help everybody who reads it take some fresh looks at the questions raised by the current immigration debate. I'M HONORED...that Dr. Andrew Jackson of SmartChristian.com has chosen to link to this second piece on immigration. He already linked to the first post. (By the way, Andy's site always has interesting links on it.) Thank you! ...including those who think that the proclamation, "Jesus is risen!" reflects a conspiracy. and has a great time. Immigration policy has become a hot button issue. The current debate finds many people, even church leaders, weighing in with opinions. I'm not going to give an opinion about how to approach immigration reform in this country. As I read the Bible, God's authoritative truth source, I can't find a chapter or verse that tells me whether or not to erect a wall on the border with Mexico; whether or not an amnesty or a fast-track to citizenship is the Christian approach to this matter. But on the pages of the Bible, I do find ways of looking at this issue, windows through which we individual Christians can consider the various immigration proposals now before us and make up our own minds. To some extent, my blogging colleague, Pastor David Wayne, has "stolen my thunder" on this issue in a well-written post on his blog. I read it and thought, "That's what I was going to say." My wife convinced me though, that I might have something else to offer here. So, here and in several subsequent posts I hope to write, I intend to talk about Biblical windows through which Christians might want to examine the immigration issue. Window #1: Christians believe in obeying the law of civil authorities, as long as those authorities don't command us to ignore God's will for human beings. We've believed this even when civil authorities were hostile to Christian faith. Let every person be subject to the governing authorities; for there is no authority except from God, and those authorities that exist have been instituted by God. Therefore whoever resists authority resists what God has appointed, and those who resist will incur judgment. For rulers are not a terror to good conduct, but to bad. Do you wish to have no fear of the authority? Then do what is good, and you will receive its approval; for it is God’s servant for your good. But if you do what is wrong, you should be afraid, for the authority does not bear the sword in vain! It is the servant of God to execute wrath on the wrongdoer. Therefore one must be subject, not only because of wrath but also because of conscience. For the same reason you also pay taxes, for the authorities are God’s servants, busy with this very thing. First, there's God's kingdom of grace. This is the kingdom under which Christians live. Christians believe that they've been given a new relationship with God, with others, and with themselves. Their old sinful selves have been crucified with Christ and by God's charity--His grace, they know that all believers in Christ live with God forever. That new status begins now, in this life. In the kingdom of grace, God doesn't have to coerce His people to love God or love neighbor. They seek to do so voluntarily. Second, there's God's kingdom of laws. Luther says that because not all will want to voluntarily surrender to Christ, God also establishes coercive government authority. Governments exist in order to establish a baseline of mutual expectations and a modicum of order among people who live in any country or community. Governments are authorized by God to levy taxes, create police and military forces, and impose fines, all to coerce those who would otherwise "go their own way" (Acts 14:16) into involuntarily acceding to respect for God and respect for neighbor. Christians are called to voluntarily submit to the kingdom of laws out of consideration for their neighbors. They know that unless people have come to submit to God's kingdom of grace, given to all with faith in Jesus Christ, the love of Christ controlling them, they are wont to live selfishly and to disregard the good of their neighbors. (Romans 3:9-20) So, in voluntary deference to the common good, Christians believe in obeying civil authority and the law. When confronted with the choice of either conforming to God's will or to the will of those who command us to do something against God's will, Christians know that we're called to go with God and His call to love God and neighbor every time. Christians then, believe in obeying the law of civil authorities, even laws regarding immigration policy, so long as they don't command us to violate God's command to love God and neighbor. The practical implication of this, of course, is that governments have a right to maintain their nation's borders. Immigration restrictions are not an inherently bad thing. That's Window #1. If the view through this window has offended you, come back here tomorrow. I suspect that what I write then will offend a whole different group of people. THANKS: Thank you, Dr. Andrew Jackson of SmartChristian.com for linking to this piece. THANKS ALSO...to Charlie Lehardy, whose blog, AnotherThink, is one of the very best around. He kindly linked to this post. but a crisis of purpose. At least that's what this post from Readeriam seems to describe. I think many Christians (and others) share the sentiments with which she's wrestling. Believers especially yearn for some clear understanding of their purpose in life. We want to know what God wants us to do. I've reflected on this and I've come to believe that our purpose is as exhilaratingly and frustratingly simple as I describe it here. None of this is to say that I don't go through periods like those described by Readeriam. I do. But I finally take solace and inspiration from sensing that God's will is a kind of magna carta of the spirit. In fact, I've always liked the way Christian contemporary music pioneer Randy Stonehill described life with Christ and with the Holy Spirit pulsating in us: a wild frontier. Back when I was in junior high school, several of my friends got into Chess, momentarily sweeping me up into their enthusiasm for the game. I really tried to get into it, even convincing my parents and grandparents to buy a Chess set for me for my fourteenth birthday. I had no idea what to do when they said that, whether I was to make the first move of the game or I was three moves into it, just about the time when they would tell me, “Check.” “It’s your move” can be an intimidating phrase! It’s part of the reason I quit playing Chess. For centuries now, scholars have debated just where the Gospel of Mark ends. Some say that it comes to an abrupt and ambiguous halt at verse 8, the last verse of our Bible lesson for today. Others say that there was another ending beyond these verses that has been lost. Some say that no, verses 9 through 20 in our Bibles today were always there. Others disagree, saying that they were added much later. I don’t know which of those theories are true, but I do know this: It wouldn’t surprise me in the least to know that however Mark originally ended his telling of the story of Jesus’ life, death, and resurrection, he did it with the same sort of abruptness we find at the end of our Bible lesson for today. Since we started looking deeply at Mark’s rendition of the Gospel story about Jesus with the beginning of the new Church Year this past November, we’ve noticed that Mark always recounts events in a breathless, Wolf Blitzer-style. And most interesting of all, maybe, is the fact that Mark begins his gospel with a sentence fragment: “The beginning of the good news of Jesus Christ, the Son of God.” It’s as if, Mark was saying that all sixteen chapters of his book are just the beginning of the Gospel story and that even that Easter Sunday when Jesus rose from the dead was just a part of the beginning. The women had come to anoint Jesus’ body as would ordinarily have been done before His burial. But there had been no time to do that before the coming of the Sabbath when He died on Good Friday. Now, they’re so stunned and terrified by their encounter with the angel and his unbelievable news that Jesus had risen from the dead, that they don’t know what to say or do. At this moment, the moment at which our Bible lesson ends, they haven’t seen the resurrected Jesus, haven’t heard His voice, haven’t seen Him walking among them. They’re asked to believe that what He promised would happen has actually happened, that He really has risen from the dead, giving the hope of everlasting life with God to all who turn from sin and believe in Jesus. That’s the question that the sparse words of Mark’s Gospel put before us today: Though like the women at this point on Easter Sunday, we haven’t yet seen the risen Jesus, our call is to turn from sin and believe in Jesus, betting our whole lives on Him, just as He gave His whole life for us. A poll released this past week tells us that most Americans don’t believe in a physical resurrection. They don’t believe that Jesus rose or that those who follow Him will either. Those were probably the sentiments of the women when the angel first told that Jesus had risen from the dead. But Jesus is willing to risk our disbelief and our rejection today, even as He was when He walked the earth. Just as He did with the women at the tomb, He calls us to dare to believe in Him. “I knelt down with my Bible on a tree stump in front of me and began praying. I don’t recall my exact words, but my prayer went something like this: ‘O Lord, there are many things in this book I don’t understand. There are many problems in it for which I have no solution...But, Father, by faith I am going to accept [Your] Word...” He dared to believe. Consider the story of another man. He grew up on the streets of Northern Ireland, the son of one parent who was Roman Catholic and of another who was Protestant. He watched as people from those two branches of the Church of Jesus Christ used their religion as an excuse to kill each other during his country's troubles. He was appalled by what he saw people doing and saying in the Name of God. And yet, he found that he couldn't turn away from Jesus. He kept following Jesus and trusting Him. And just look at the world of good that Bono, the lead singer of U2, has done for the victims of AIDS and poverty in Africa because of his connection with Jesus Christ. In faith, he trusts God even if he still hasn't completely found what he's looking for. One of the things that Mark repeatedly emphasizes in his Gospel is how the promises Jesus makes come true. That’s underscored in our lesson today in the words of the angel who reminds the women that Jesus had already promised the disciples that after He was resurrected, He would meet them in the region close to the Sea of Galilee. 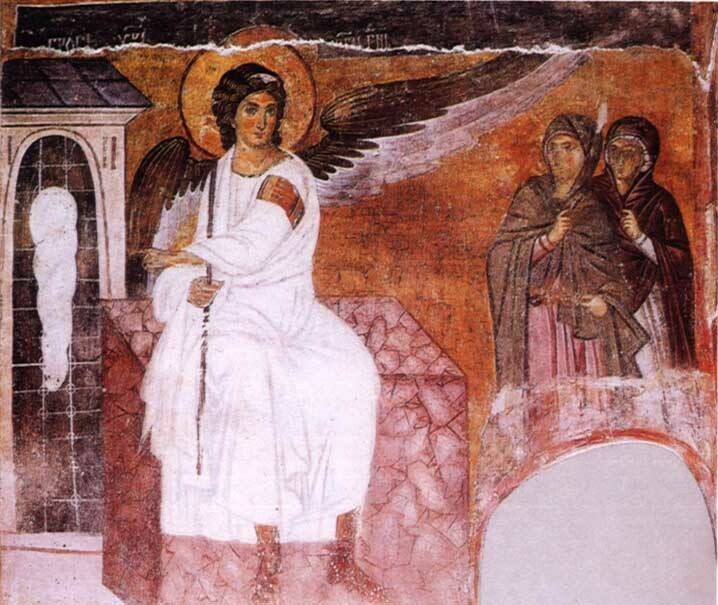 “Tell Peter and the others that Jesus has gone ahead of them and will meet them there,” the angel tells the terrified women. Sure enough, the disciples would later find that to be true. The point is that you can count on the Word of God and of God in the flesh, Jesus. When the Word from God is that Jesus Christ is risen, you can believe it. When the Word from God is that He brings forgiveness of sin and everlasting life to all who trust in Him, you can believe it. But you and I can never know these things by hanging back, or by refusing to repent and follow, or by daring Him to prove Himself to us. It’s up to us instead to believe and follow. Jesus is risen and He calls us to follow Him. In Christ, God has proven that He believes enough in us to die and rise for us. Now, it’s our move. It's our turn to believe in Him, to trust that the risen Savior is willing to stand with us until the end of this age and beyond. It's our move and heaven waits for our response.